As with all endeavors in life, it is never too late to find your passion! Anna Mary Robertson Moses, better known as Grandma Moses, waited until the spry age of 78 to see her painting career blossom. Her success has made her one of the best known American artists both at home and abroad. From a seemingly ordinary life, came world-wide acclaim and even a postage stamp! Grandma Moses was born to farming parents on September 7, 1960 in New York. Her artistic drive appeared early in life as she would use lemon and grape juice as a child to create her early landscape pieces. She would use other ingredients around the farm to make her paints such as ochre, grass, flour, and sawdust. When she went to work for a wealthy farming family at the age of 12, her employers noticed her interest and bought her chalk and crayons so that she could create her artwork. At the age of 27, she married her husband and they moved to Virginia. Five of her ten children survived infancy and in 1905, she and her husband moved back to New York. It was in New York that one of her first accredited paintings was created on a fireboard in her home. It wasn’t until the death of her husband in 1927 that Grandma Moses began painting frequently, an attempt to keep herself busy to help with her grief. She did much of her crafting in needlework, but once her arthritis set in, she took to painting. 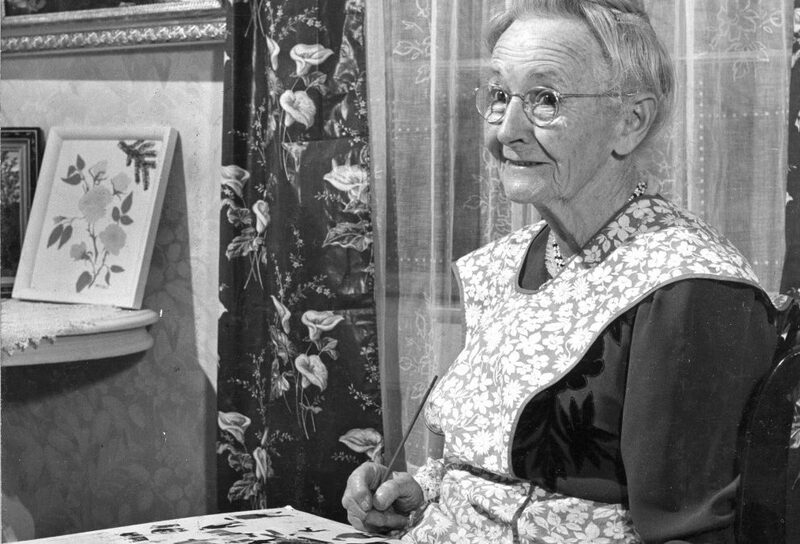 Grandma Moses’ big break would come a decade after her husband’s passing in 1938. Her work was displayed in a local store when art collector Louis J. Caldor saw her pieces and bought all of them. Her next break came a year later when her work was showcased with other “unknown artists” at the Museum of Modern Art in New York City. Her work always drew from her memories of farm life and rural living which is thought to have been some of the cause for her acclaim. The country reeling from WWII was eager to be reminded of better times and a longing for innocence. Her work has been reproduced in prints, on greeting cards, and she even has a stamp minted in 1969. For her work in the arts, President Truman awarded her the Women’s National Press Club trophy in 1949. In 1952 she published her autobiography, My Life’s Story and she has been featured on the covers of TIme and Life magazines. Grandma Moses died on December 13, 1961 at the youthful age of 101. She created over 1500 works of art that, to this day, remain popular as a window into America’s past. What a long, fulfilling life indeed. The 2017 – 2018 School Year has begun, and we want to wish all of our artists a happy year! This year’s summer camps were a blast, as always and we thank all of our campers and instructors for making this year’s summer so memorable!